The foundation of Brenda's handcrafted art is the fiber. Often acquired from small growers supporting good causes like the preservation of rare breeds. Many of the mixed-media pieces feature upcycled fabrics, repurposed yarns and objects of nature. Keepsake items, memory fabrics, photos and even fiber from a favorite pet can be utilized in a handspun yarn or finished work. Contact Us if you have a special project in mind. A journey "down the rabbit hole"
A peek into the fiber studio of Brenda Dunse reveals a complex woman with the curiosity and faith of a child. While in pursuit of her life purpose and meaning Brenda took a journey "down the rabbit hole". Much like Alice in Alice's Adventures in Wonderland was her experience when she was introduced to an alpaca and it's lustre fiber. 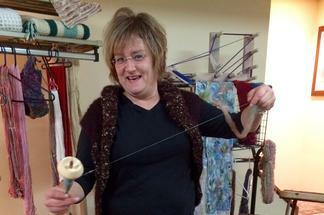 A passion for the ancient textile art of handspinning and all things fiber art was revealed. Serendipity: "fortunate happenstance" or a "pleasant surprise"
Through Serenity Textile Designs, LLC Brenda is able to share her passion for fiber arts with others.